*Address correspondence and reprints request to: Dr. Farheen Badar, Department of Radiodiagnosis, JNMC, Aligarh-India. Badar F, Azfar SF, Ahmad I, Yasmeen S, Kirman S. Diagnostic Difficulties in Differentiating Sarcoidosis from Tuberculosis. Oman Med J 2011 March; 26(3):210-211. Distinguishing sarcoidosis from pulmonary tuberculosis can sometimes be a great challenge to physicians, especially in developing countries where there is high prevalence of tuberculosis. Both tuberculosis and sarcoidosis are granulomatous diseases, however, tuberculosis has a caseating granuloma as opposed to sarcoidosis, which present with non-caseating epithelioid cell granuloma. Due to the marked clinico-radiological similarity of these entities and high prevalence of tuberculosis, these patients receive repeated courses of anti-tubercular therapy (ATT) while lung damage continues to progress. Recently, a 51 year old man presented to the out-patient department at Firoz Specialist Hospital, with one year history of non-productive cough, on and off low grade fever, and 9 kg weight loss. He was on ATT for the past one month. He had a past history of pulmonary tuberculosis 15 years before, for which he had a complete course of ATT. Respiratory system examination revealed inspiratory crept throughout in the right lung. Laboratory investigations showed normocytic normochromic anemia, white blood count 7530/mm3, erythrocyte sedimentation rate 45 mm at the end of one hour. Sputum for acid fast bacilli was negative. Chest radiography showed inhomogeneous opacity with reticulations in the right upper-mid zone (perihilar region), as shown in Fig. 1. High resolution Computed Tomography (HRCT) of the thorax revealed a cavitatory lesion in the posterior segment of the right upper lobe with multiple nodules in the anterior segment of the upper lobe and the middle lobe (Fig. 2). It was also associated with thickening of the interlobular septa and peri-bronchovascular bundle. Radiological differential diagnosis would be tuberculosis, sarcoidosis and lymphangitis carcinomatosis. However, secondary reactivation of tuberculosis was strongly suspected considering both clinical and radiological (mainly the cavitatory lesion) findings. 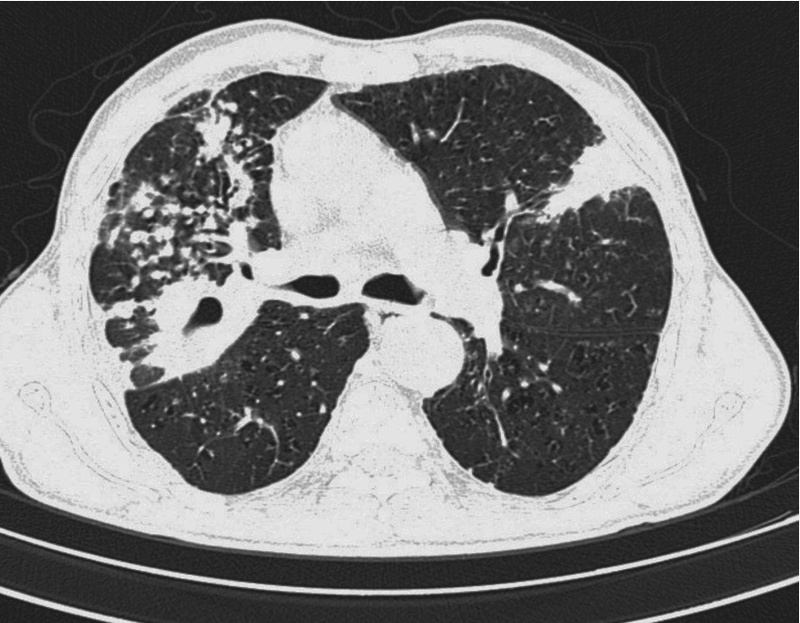 Computed tomography guided lung biopsy revealed the presence of non-caseating granulomas suggestive of sarcoidosis. The patient was treated with prednisolone 60 mg/day. Within 3 weeks, marked clinical improvement was seen. Steroid was gradually tapered over the period of 4 weeks. The patient remained asymptomatic during the next six months. Figure 1: Chest X-ray (PA)-shows reticulonodular opacity in right perihilar region. 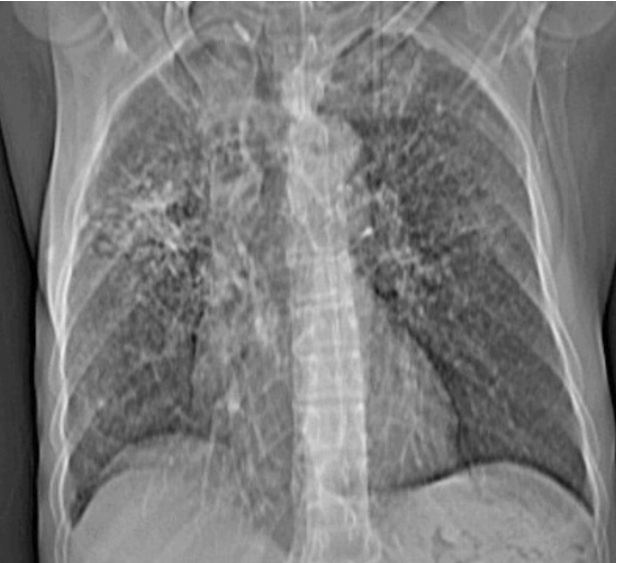 Figure 2: HRCT thorax- shows a thick walled cavitatory lesion with multiple nodules in right middle lobe along with thickening of interlobular septa and bronchovascular bundle. Also patch of consolidation seen in lingular lobe. 1. Miller BH, Rosado-de-Christenson ML, McAdams HP, Fishback NF. Thoracic sarcoidosis: radiologic-pathologic correlation. Radiographics 1995 Mar;15(2):421-437. 2. Grenier P, Valeyre D, Cluzel P, Brauner MW, Lenoir S, Chastang C. Chronic diffuse interstitial lung disease: diagnostic value of chest radiography and high-resolution CT. Radiology 1991 Apr;179(1):123-132. 3. Wong CF, Yew WW, Wong PC, Lee J. A case of concomitant tuberculosis and sarcoidosis with mycobacterial DNA present in the sarcoid lesion. Chest 1998 Aug;114(2):626-629.